The Cynefin framework helps leaders and managers to identify how they perceive situations and make sense of what actions are appropriate for their given context. Essentially it is a sense-making device that asks what context are you in and builds on the premise that different situations require different ways of navigating. 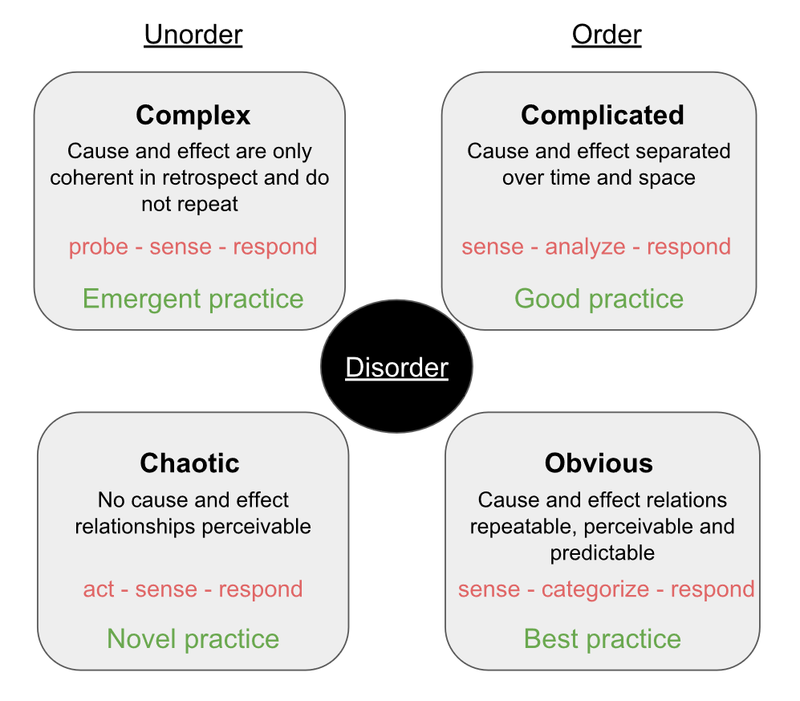 The Cynefin framework identifies three domains: Order, Unorder and Disorder. The domain of Order is characterized by cause and relationships that can be understood and perceived over time. The Domain Unorder is more complex and here only patterns can be perceived, mostly in retroperspective, while keeping in mind that once those patterns emerged and can be described, they are probably already outdated. Moreover, our observation and intervention also affected and changed the pattern. The Unorder domain is a constant flux, constantly changing. The domain of Disorder is mainly arising when different stakeholders or agents that need to make sense of a given situation cannot agree on one domain to categorize the situation in. This is the space where you do not know where you are and feel lost. The action to take, also called the decision model, is to gather information, identify one of the other four domains, and move on. Let’s have a closer look at the four domains in the Order and Unorder category and what are the appropriate decision models for each context. The first domain is the simple or obvious domain. “Simple contexts are characterized by stability and clear cause-and-effect relationships that are easily discernible by everyone.” The right answer is ‘known’ by everyone involved and “decisions are unquestioned because all parties share an understanding”. It is the realm of “known knowns”. Typical examples of the obvious domain are order processing and fulfillment. For example, an invoice is not paid after delivery. The person handling the invoices realizes the unpaid invoice, looks up the conditions in the contract and takes actions according to a standard handbook, manual or laws. Usually there is one best practice present and known to everyone involved, e.g. written down in a contract. Single-point forecasting, field manuals, and operational procedures are legitimate and effective practices in this domain. The action mode for the obvious domain is to sense the situation, categorize the situation into a known bucket and respond with a well-known solution. This seems straightforward, which is why this domain was also named simple in the past versions of the Cynefin framework. Another risk is path dependency, or named entrained thinking by Dave Snowden. This refers to a conditioned response, where people are not open to new ways of thinking. Leaders and managers become blinded by the perspectives they acquired through their past experience, training and success. The personal bias limits their ability to see new possibilities, new paths. Another risk is complacency, which can occur when things appear to be going smoothly. A sudden change in the context is likely to be missed, and any reaction that follows is too late. It is no surprise that within the Cynefin framework the simple domain lies next to the chaotic one. A catastrophic failure, meaning a shift into chaos, occurs most frequently because success has bred complacency. Just think of the many dynamic technology inventions that ‘suddenly’ disrupted whole industries. The complicated or knowable domain contains multiple good practices that can achieve you the desirable outcome. This is based on that there is a clear relationship between cause and effect, but not everyone can see it. It is basically separated over time and space. It is the realm of “known unkowns”. Even if I do not know the solution or the path leading me to solving a challenge, I probably have a sense of who would know the answer. It is the call for expert opinions, which could differ, because they have their own unique interpretation and solution for the cause and effect relationship they observe. Often a “complicated analysis and understanding of consequences at multiple levels” is required. The action mode is to analyze the problem and roadmaps, sense the problem and respond with a plan (often provided by an expert who has a good practice available). As in the obvious contexts, entrained thinking is a danger in the complicated domain as well. However, here it is the experts (rather than the leaders) who are prone to it. Experts that have invested in building their knowledge are unlikely to tolerate controversial ideas, thereby dismissing or overlooking innovative suggestions by nonexperts. Additionally, there is a key dependency on trust between expert advisor and decision maker. The complex domain is where we face wicked problems. The truth is out there somewhere and through trusting the process and cultivating our ability to play the emerging practice will present itself to us. The path appears while we are walking on it. Most platform technology designs are emerging in this way, starting with a safe enough to try idea and building the necessary features on the way, perhaps through input from its users. To be very clear, what we are observing in a complex context is not a direct cause and effect relationship, rather a pattern that emerges. However, we need to keep in mind that “once a pattern has stabilized, its path appears logical, but it is only one of many that could have stabilized, each of which also would have appeared logical in retrospect.” Moreover, it could be that a pattern stabilizes and repeats itself, but it is not sure if that pattern continues to repeat, “because the underlying sources of the patterns are not open to inspection.” In addition observing of the objective of interest may in itself influence the pattern and change what we observe. “The decision model in this space is to create probes to make the patterns or potential patterns more visible before we take any action. We can then sense those patterns and respond by stabilizing those patterns that we find desirable, by destabilizing those we do not want, and by seeding the space so that patterns we want are more likely to emerge. Understanding this space requires us to gain multiple perspectives on the nature of the system. This is the time to “stand still” (but pay attention) and gain new perspective on the situation.” Narrative techniques are particularly powerful in this space. The primary challenge that leaders face in the complex domain “is the temptation to fall back into traditional command-and-control management styles—to demand fail-safe business plans with defined outcomes. Leaders who don’t recognize that a complex domain requires a more experimental mode of management may become impatient when they don’t seem to be achieving the results they were aiming for. They may also find it difficult to tolerate failure, which is an essential aspect of experimental understanding.” If leaders try to overcontrol the organization, they shut down the opportunity for informative patterns to emerge. In a chaotic context, searching for right answers is pointless, because the relationships between cause and effect are impossible to determine. They are shifting constantly, thus no manageable patterns exist—only turbulence. This is the realm of unknowables. It is possible to change domains in the Cynefin framework. As knowledge increases there is a clockwise drift from chaotic through complex and complicated to obvious. There can also be counter-clockwise movement as people die and knowledge is forgotten, or as new generations question the rules; and a counter-clockwise push from chaotic to obvious can occur when a lack of order causes rules to be imposed suddenly. It is essential for decision-makers to know the domain their current challenge is in, so that you can apply the appropriate action modes. It becomes obvious that the transformation towards agile, human-centric, self-managed, socially sustainable work environments or teal, which is at this point in time an unordered path, creates and brings forward novel practices like for example Holacracy, etc. At the same time there are emerging practices and observable patterns that are pointing to principles that can be beneficial for organizational transformation, like focusing on the human aspect instead of only procedural changes or engagement and involvement over top-down directives. In complex contexts the solutions need to emerge from the community instead of being imposed from the leader in a top-down way. As we are moving to an increasingly complex future, or even chaotic one, where we cannot predict the future outcomes by past behaviors, forecasting or planning, it also emerges and becomes obvious that there is a novel quality and practice required for decision-makers and leaders, not only in organizational contexts. That is to lead, oneself and others, from a space of intuitive insight. We need to pause and reflect to make sense of our context, act from a place of increased consciousness and often go against what our rationality or instinct tells us would be the right thing to do. We also need to question our own way of thinking and beliefs that we hold, question everything we know. Are we stuck with what we have done in the past or are we open to novel practices and thoughts and ideas from non-experts, or places we normally would not look for inspiration? Are we flexible enough to look at each situation and context separately and make a new, individual assessment? Are we willing to respond to each context differently? “Business schools and organizations equip leaders to operate in ordered domains (simple and complicated), but most leaders usually must rely on their natural capabilities when operating in unordered contexts (complex and chaotic). In the face of greater complexity today, however, intuition, intellect, and charisma are no longer enough. Leaders need tools and approaches to guide their firms through less familiar waters. David Snowden created the Cynefin framework in 1999 then working for IBM Global services. Cynefin is Welsh for habitat, a word “that signifies the multiple factors in our environment and our experience that influence us in ways we can never understand”. In 2013 he and Cynthia Kurtz, an IBM researcher, described the framework in detail in a paper, “The new dynamics of strategy: Sense-making in a complex and complicated world“. In 2007 Snowden and Mary E. Boone described the Cynefin framework in the Harvard Business Review, under the headline “A Leader’s Framework for Decision Making” and were awarded “Outstanding Practitioner-Oriented Publication in OB” from the Academy of Management‘s Organizational Behavior division. The Cynefin Centre – a network of members and partners from industry, government and academia – began operating independently of IBM in 2004. What context are you, your organization or your current task in?